I sometimes flick through magazine pages amazed with some of the trends being featured. Who and why would ever want to wear that?! On the other hand, some of my nearest & dearest consider my wardrobe quite 'out there' and only the other day I had a chat with my boy who confirmed that he no longer pays any attention to the weird clothes I wear (honesty is the foundation of a good relationship;). So as a general rule, I wouldn't judge a person/ outfit / trend until I actually try and understand it myself. I decided that testing some of these may actually be fun. After all, if they don't work, you get to laugh at me! Being a comedian was never in my plans but hey whatever makes you dear reader happy! 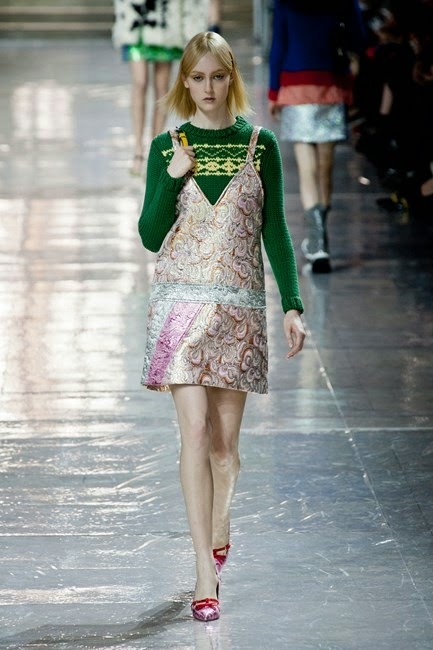 Here it is so, a trend test of Miu Miu's look below. The concept? A jumper / roll neck worn under a strappy, rather summery, potentially metallic dress. Not sure I'm convinced but looking forward to your views!